The Khaibar-1 is significant because the rocket has a 100 km range, longer than most of the Katyusha-type rockets in the Hezbollah rocket force. The rocket was first fired at the Israeli city of Afula, east of Haifa. 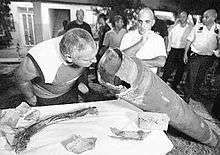 In early August 2006, Khaibar-1 rockets were reported to hit Beit Shean, about 70 km south of the Lebanese border, Hadera, and Haifa, Israel's third-largest city. The expression 'Hai-bar' in Hebrew, which is pronounced in a similar way as Khaibar, means a breeding ground for animals. This resulted in many Israelis reacting to the name of the rocket with humor. Khaibar, also spelled Khaybar, is an oasis approximately 95 miles east of Medina, which was once the largest Jewish settlement in Arabia. The name was chosen as a reminder of the Battle of Khaybar, a battle that took place in 629 between Muhammed and his followers against the Jewish people who inhabited the settlement. Weishi Rockets from which the Khaibar possible derived and also called M-302. ↑ "Hezbollah's Rocket Blitz - by David Eshel". Defense Update. 2006-10-29. Retrieved 2013-10-19. ↑ "Police: Missile fired at Hadera - Israel News, Ynetnews". Ynetnews.com. 1995-06-20. Retrieved 2013-10-19. ↑ "'Hezbollah has long-range surface-to-air missiles'". Jpost.com. 2012-01-19. Retrieved 2013-10-19. ↑ "JPost | French-language news from Israel, the Middle East & the Jewish World". Fr.jpost.com. 2013-10-15. Retrieved 2013-10-19. ↑ "For first time: Hizbullah targets Hadera area - Israel News, Ynetnews". Ynetnews.com. 1995-06-20. Retrieved 2012-11-07. ↑ "Record number of rockets hit north; 80 hurt - Israel News, Ynetnews". Ynetnews.com. 1995-06-20. Retrieved 2012-11-07. ↑ "Hai Bar Wildlife Preserve - Yotvata - Negev and Arava Travel Information". Trekker.co.il. Retrieved 2012-11-07. ↑ "Hamas firing long-range M-302 rockets at Israel, capable of 150-km distance". Haaretz. Retrieved 2014-07-09.